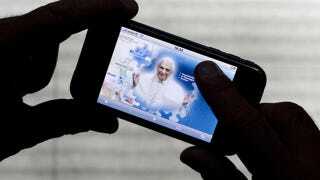 The Vatican's lending iPods to pilgrims touring the Catholic church's stomping ground. The aim is twofold: On one hand, it'll lower noise brought on by yapping tour guides; on the other, they hope to attract younger members of the faith. With a tap of the finger, tourists can zoom in on high-resolution images of artistic details, like the starry blue canopy above the towering high altar, decorating vaulted ceilings. The apps user also can refer to images from the Vatican Library not usually available to the public to enrich their understanding of their basilica tour.